The Northeast is about to get 14-20″ of the white fluffy stuff and 60mph winds. As I race home south on the Merrit Parkway in Connecticut, preparing to hop on a train to New York City I’ve put together a lovely guide for you to turn your iPhone into your best blizzard buddy. Since the iPhone’s pre-installed Weather app may as well be made up of smiley faces, I recommend downloading these useful weather apps for the iPhone to help you plan for today’s Post-Christmas storm. The DryCASE is a vacuum-sealed, flexible, clear waterproof bag that provides complete use of your phone, tablet, MP3 player or camera while keeping it dry and clean. The DryCASE by Dry Corp has been named a Top 25 finalist in the “Last Gadget Standing” competition at this year’s CES. The DryCASE also inclues a headphone jack so you can listen to music as you shred the gnar gnar. The DryCASE is 4.25 inches wide and 6.5 inches long and will fit almost any phone, camera or MP3 player. A larger iPad, Kindle and PC tablet version is also available. Buy here. (US $39.99) The company is offering 20% off orders right now, use coupon code: ‘DRY2010’. Don’t feel like going outside? *lame* Have a snowball fight with your friends on Facebook. 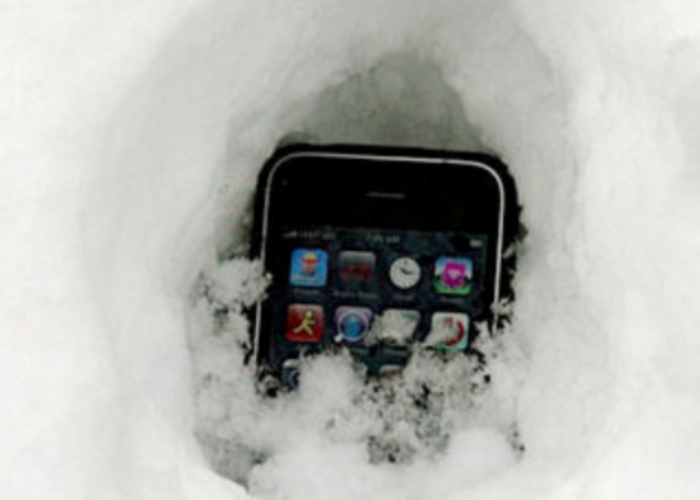 Know any other cool ways to use your iPhone in a blizzard? Let me know!